The CLASS statement contains the variable that distinguishes the groups being compared, and the VAR statement specifies the response variable to be used in calculations. The COCHRAN option produces p-values for the unequal variance situation by using the Cochran and Cox (1950) approximation. Equal-tailed and uniformly most powerful unbiased (UMPU) confidence intervals for are requested by the CI= option. Output from these statements is displayed in Figure 106.4 through Figure 106.7. Simple statistics for the two populations being compared, as well as for the difference of the means between the populations, are displayed in Figure 106.4. The Gender column indicates the population corresponding to the statistics in that row. The sample size (N), mean, standard deviation, standard error, and minimum and maximum values are displayed. Confidence limits for means and standard deviations are shown in Figure 106.5. The test statistics, associated degrees of freedom, and p-values are displayed in Figure 106.6. The "Equality of Variances" test in Figure 106.7 reveals insufficient evidence of unequal variances (the Folded F statistic = 1.53, with p = 0.6189). 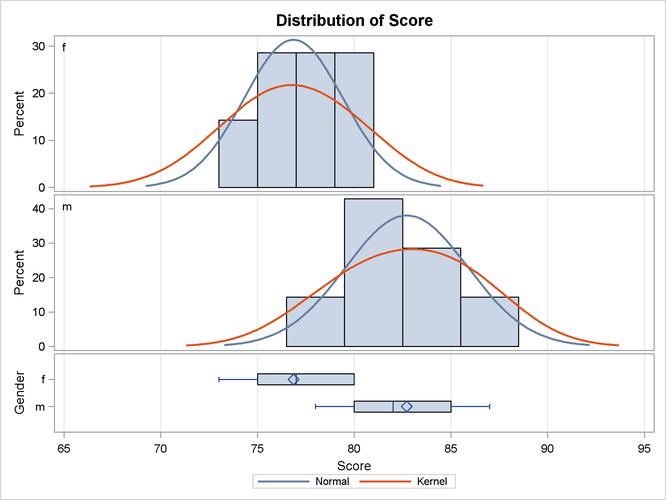 The summary panel in Figure 106.8 shows comparative histograms, normal and kernel densities, and box plots, comparing the distribution of golf scores between genders. 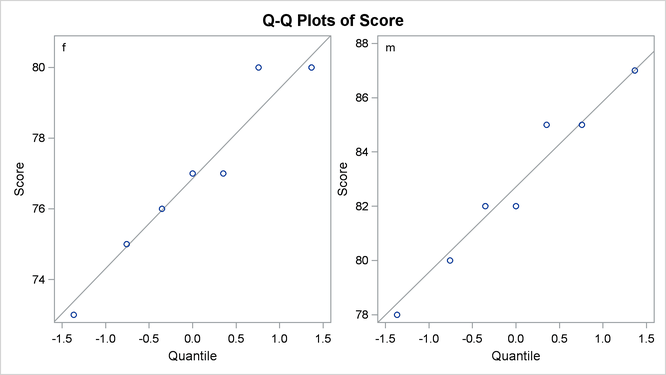 The Q-Q plots in Figure 106.9 assess the normality assumption for each gender.